From left Satish Kumar from Unity Fiji,Aminiasi Navuso of Freedom Alliance Party, Seni Nabou,NFP leader Mahendra Chaudry and SODELPA leader Sitiveni Rabuka during the parties press confrence at the Wesley Church hall Suva on August 16,2018.Photo:Simione Haravanua. The six Commissioners of the Electoral Commission and its chairperson Suresh Chandra are concerned about the personal attacks levelled by five political parties against the Supervisor of Elections and Mr Chandra. 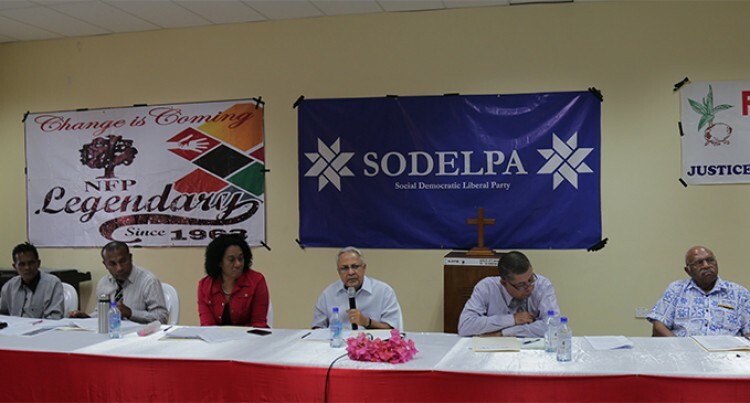 They are the National Federation Party, SODELPA, the Fiji Labour Party, Unity Fiji and Freedom Alliance Party. During a press conference at the Wesley Church Hall yesterday issues raised by party representatives included claims that they no longer had confidence in the independence, impartiality and credibility of Mr Chandra and Mr Saneem. The political parties doubt the ability of the two to deliver a free, fair and credible 2018 General Election for Fiji. Speaking at a press conference shortly after, Mr Chandra said the personal attacks were not right and could not be condoned. “Going into personal attacks is nothing, but taking it to the gutter. Mr Chandra said it was sad to note that the statements made by the political parties demonstrated their lack of regard for the election process. “This is indeed a pathetic attempt to undermine an election that has not happened yet,” he said. He said the 2013 Constitution empowered the commission and the supervisor of election to conduct the election based on the roles in place, adding that it seemed that the parties did not understand that. “The election is around the corner and in 2014 they were crying that there were too many changes too close to the election. This time when we want to keep things consistent they are crying that we should do last-minute changes,” Mr Chandra said. The political parties tabled 18 issues, which they claim to have requested clarification on from the commission in late July and early August 2018 and they say remain unanswered. During the press conference Mr Chandra showed copies of the letters and said they sent two replies to the parties on July 30, 2018, and August 8, 2018, respectively. “It is incorrect for the parties to say they did not receive responses when they do not like the contents of our response,” he said. Mr Chandra reiterated that the commission had implemented 20 recommendations out of the 38 from the Multinational Observer Group (MOG), which was more than any other commission in Fiji’s history. “Parties are in a different world when they blatantly state that the electoral commission is a passive commission. “One has to only look at least 18 or so months since our appointment and you will see how much we have done in such a short span of time. Supervisor of Election Mohammed Saneem said there was a need for more “political maturity” in the kind of outbursts displayed by the parties. “Was the press conference this afternoon aimed at a free and fair election or was it aimed at derailing a free and fair election,” Mr Saneem asked. He said the question of the credibility of the election was only going to be answered once the process has started.